The following list of temperature controllers is organised by size to help our customers get to the product they need fast. Low cost 48mm x 48mm Temperature Controllers, perfect for OEM applications. PXR series of temperature controllers offer a ultra reliable and cost effective solution flexible enough for most temperature applications. On/off, PID or Fuzzy Logic control is available. If you are unsure which temperature controllers is right for you, our guide will help you getting the right unit. Fuji Electric make it easy to upgrade to a new model. Check out our interactive equivalence table to see which model you need to replace your old temperature controller. OMC Srl, Series80 pnuematic temperature controller. What is a Temperature Controller and how does it work? A temperature controller is an instrument used to control temperature. It does this by comparing the process temperature (process variable) with the desired value (set value). The difference between these values is known as the error (Deviation). 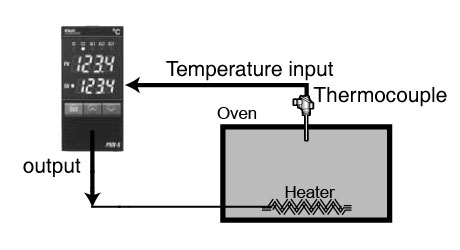 Temperature controllers use this error to decide how much heating or cooling is required to bring the process temperature back to the desired value. Once this calculation is complete the controller will produce a signal that effects the change required. This output signal is known as the manipulated value and is normally connected to a heater, control valve, fan or some othe "final control element" which actually injects or removes heat from the process. The role of the temperature controller is to measure the temperature on the thermometer, compare it to the set point and to calculate the amount of time the heater should remain switched on to maintain a constant temperature. If you need more heat, switch on the heater. The important point, is that the temperature controller has one input, one output and one set point.